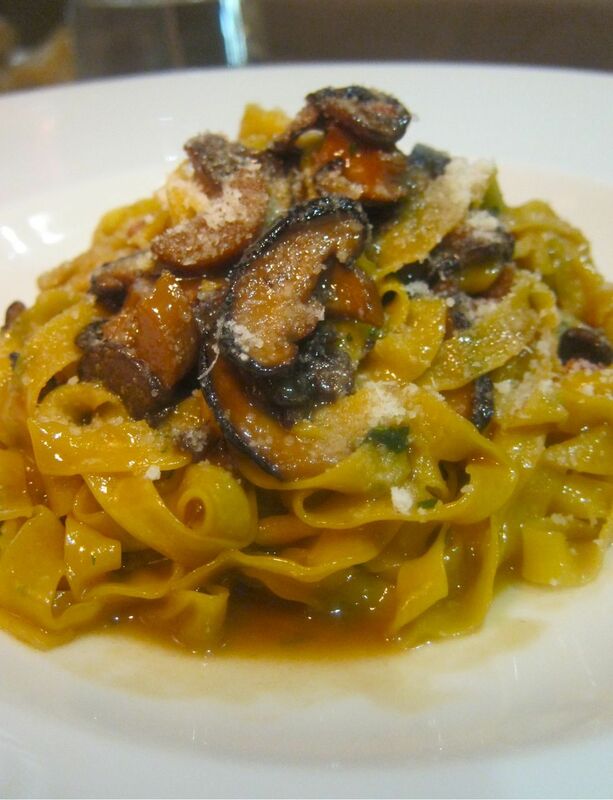 Wild mushrooms trifolati hold their own on housemade tagliatelle. How quickly Upper East Side noisemakers discovered Ristorante Morini. Well, of course they were impatient waiting for its pots to warm up once Pino Luongo abandoned his crumbling effort at Centolire. From across the park, I too muttered about what could be taking so long. I know the rehab and décor cost big bucks but the minimalist design leaves me cold. 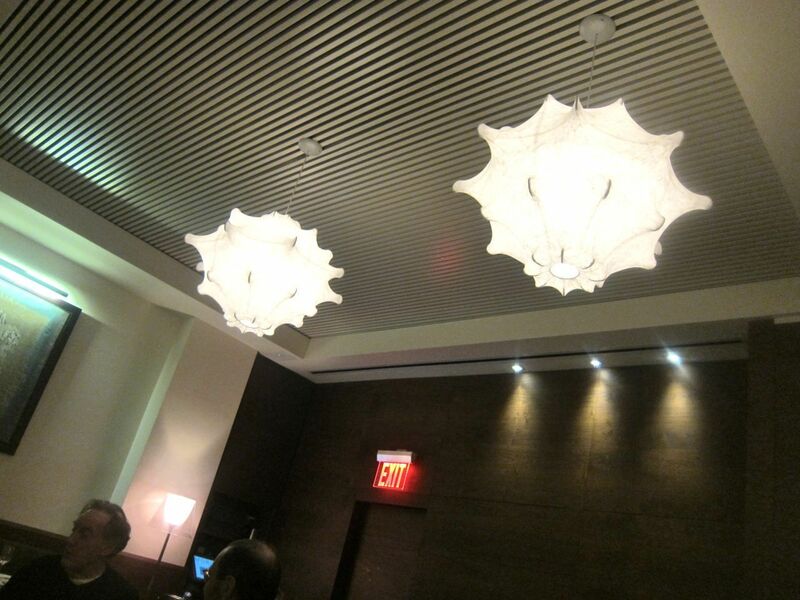 It seems chef Michael White and his money’d partner, Ahmass Fakahany, thought they’d just throw a designer on the job. Then they looked closer, noticing window gaps and infrastructure fatigue. “We decided to just do everything,” Fakahany tells me, glancing about the room at the private opening party to benefit Citymeals-on-Wheels [my confession]. Sea scallops are perfectly cooked. I expect nothing less from Michael White’s kitchen. I hoped to fall in love with this newest enterprise from White – his third in 2013. I could no longer say he was as big as his ambition since he’s lost 40 pounds between Costata in Soho and Madison Avenue. But he is bent on empire. The timing is right. 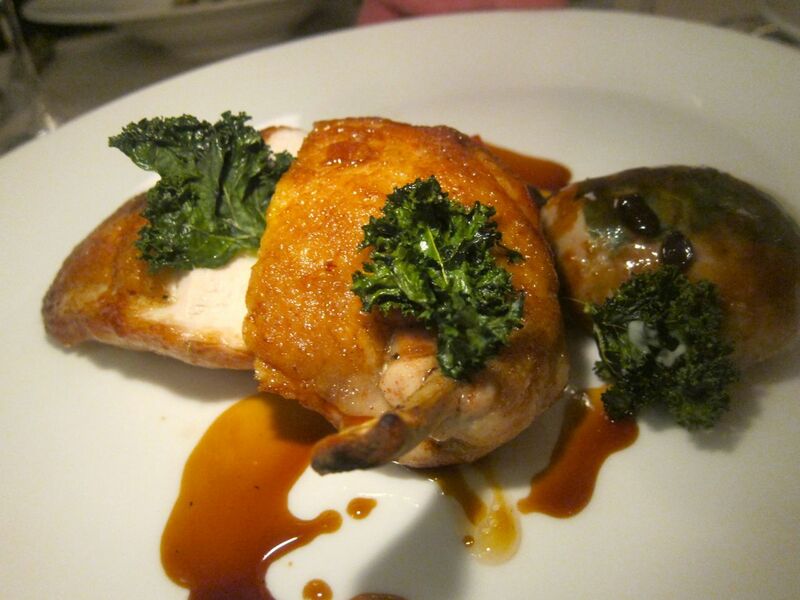 Upper East Side friends, always complaining about cuisinary neglect, seem to need an indulgence. But the rich, minimalist look -- costly wood paneling, blowsy free form chandeliers and the caress of Italian leather seats – left me cold. Call me uncultivated. There are restaurants with unthrilling design that are not so annoying. On the other hand, I definitely appreciated the sound-proofing. 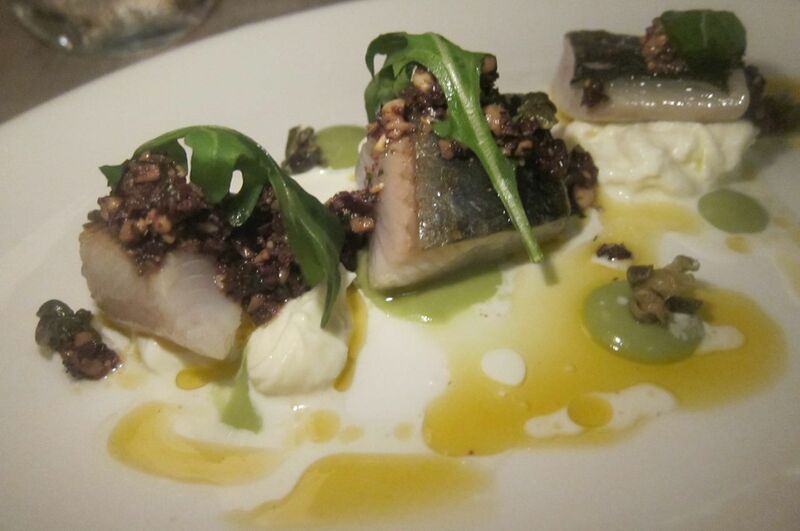 Cured mackerel with mozzarella di bufala and minced green olives is a hit. An early birthday dinner was a mixed message for five of us in the back room. (An Altamarea Group pet assures me that’s where they put people they don’t know.) The chef was in the house, revising and sending out new dishes every day, our waitress confided. Still, most of us were high on the cured mackerel with bufala mozzarella and the agnolotti (plump little packages of beef shank and celery root) that we passed around. Lobster and prawn risotto with coral butter excited three mouths, but not mine. I did join the majority in loving the gnocchi, but then I’m a pushover for those gummy little dumplings. Here wild mushrooms on tagliatelle held their own under a luscious too-muchness of squacquerone cheese. 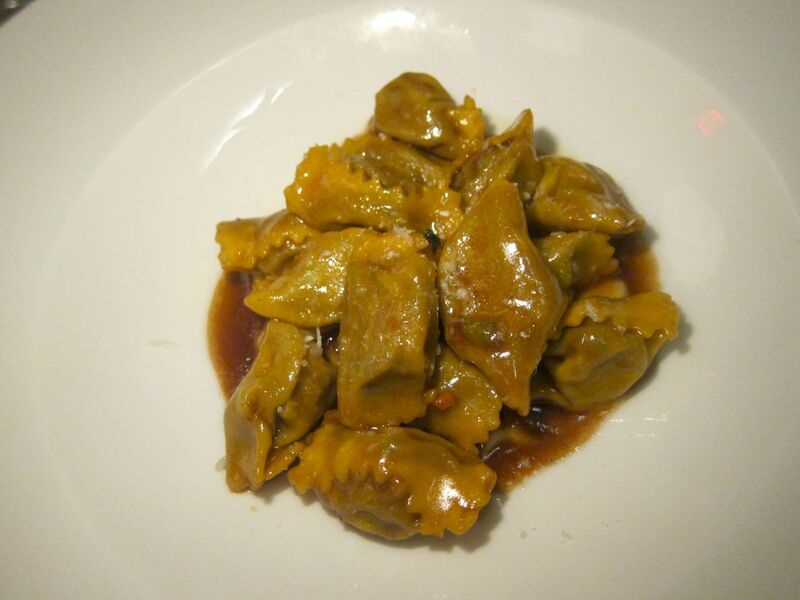 Agnolotti are rich little parcels of beef shank and celery root in a red wine sauce. I was already hearing raves from the locals when my own second outing two weeks later left me feeling discouraged. A new appetizer, the $24 guazzetto, had one perfect shrimp and little oomph. 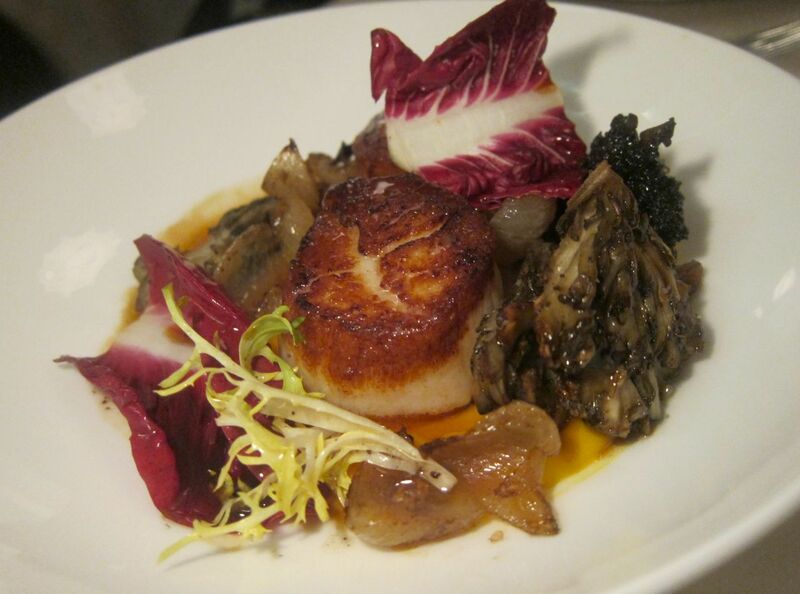 A sautéed scallop was properly cooked, sweetly caramelized, daringly rare but ho-hum. Beef carpaccio gets a new look and flavor with squaquerine cheese and toast thins. Okay, the thin length of Piemontese beef carpaccio was adorable with cute little packages of cheese and toast shards. 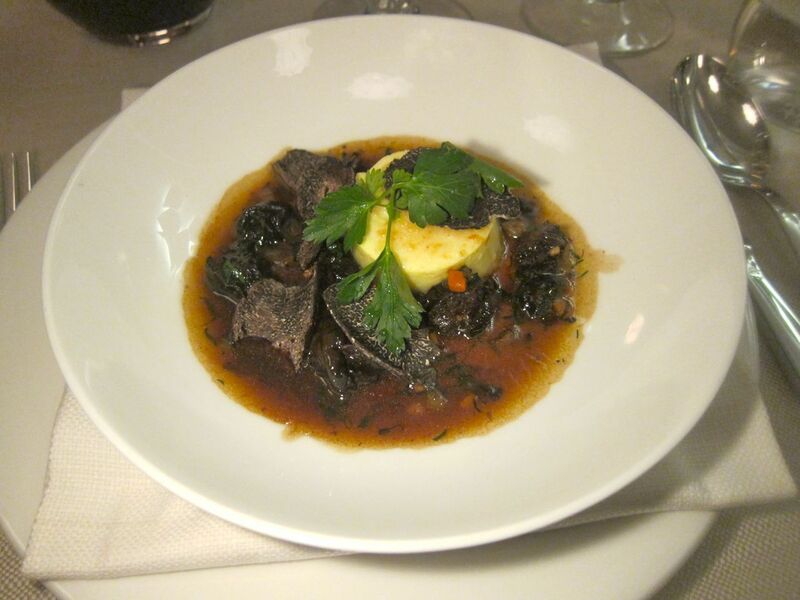 A companion thought the braised snails with black truffle were “brilliant.” I looked her in the eye. Was I missing a gear here? For me, a snail is drowning in garlic butter or else it can stay in the jar. Marsala-braised snails with porcini and almond milk mousse won the snail fan at our table. 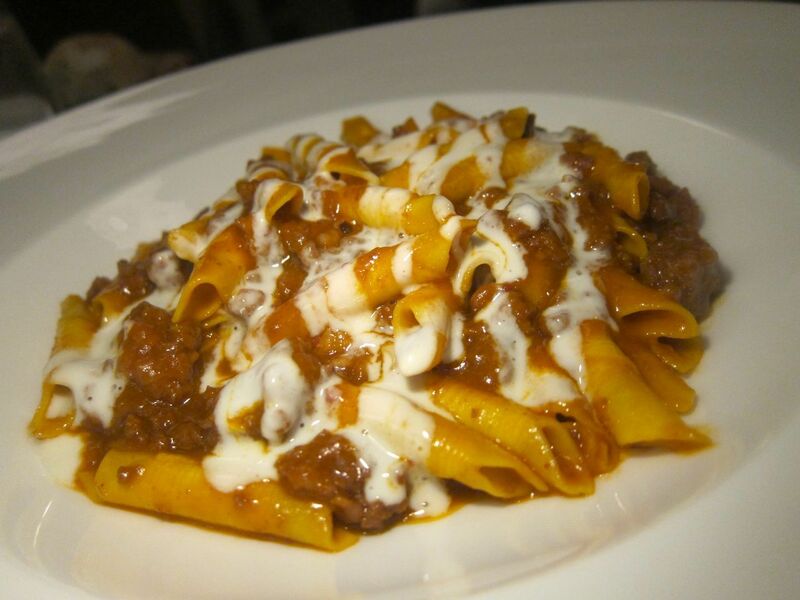 I wanted the paccheri all’amatriciana to have a little kick. I could only handle a bite or two of the garganelli first time around it was so drowned in cream, but on this night I needed that decadence because the chicken was overcooked and rather boring (except for the crepinette of dark meat wrapped in a caul). It’s not like me to gripe about an excess of richness. I came to love the garganelli. What’s wrong with Ristorante Morini? It’s too buttoned up, I thought. White has decided the locals can’t handle the exuberance of his Morini downtown. He and executive chef Gordon Finn keep the reins on. Maybe I wouldn’t be so unmoved if he’d given it another name. I loved his diabolical cooking at Osteria Morini on Lafayette. I just couldn’t take the chaos and uproar. Uptight and overcooked, the chicken competed with memories of Writing Room’s bird. I’m a serious fan of Marea too. I will choose it for a rich friend’s birthday, delighted that they are paying. But I am also so high on White’s crudos and the bold and sensuous pastas, that I have been known to go on my own dollar. And Costata on Spring Street was full of culinary bombast too – at least early on when I went twice. 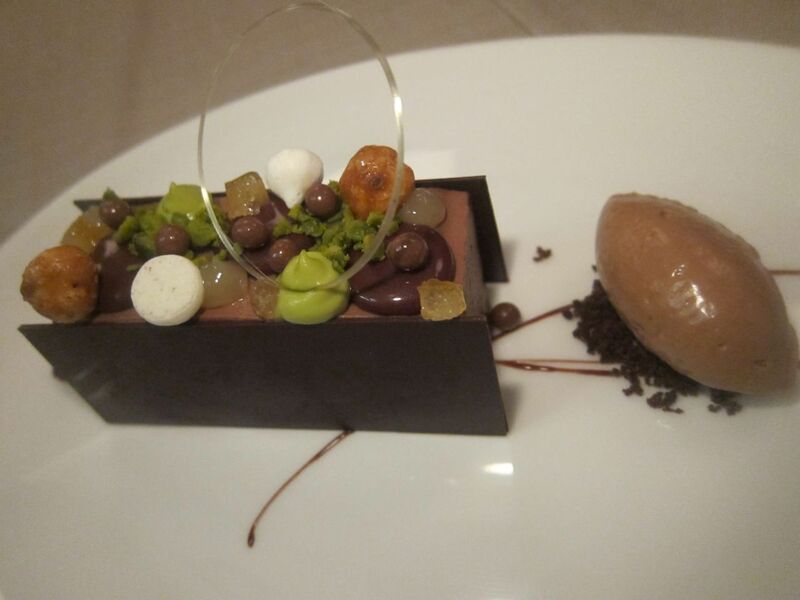 Rowan Johnson’s Chocolate Fiorentina has a jewel box look. 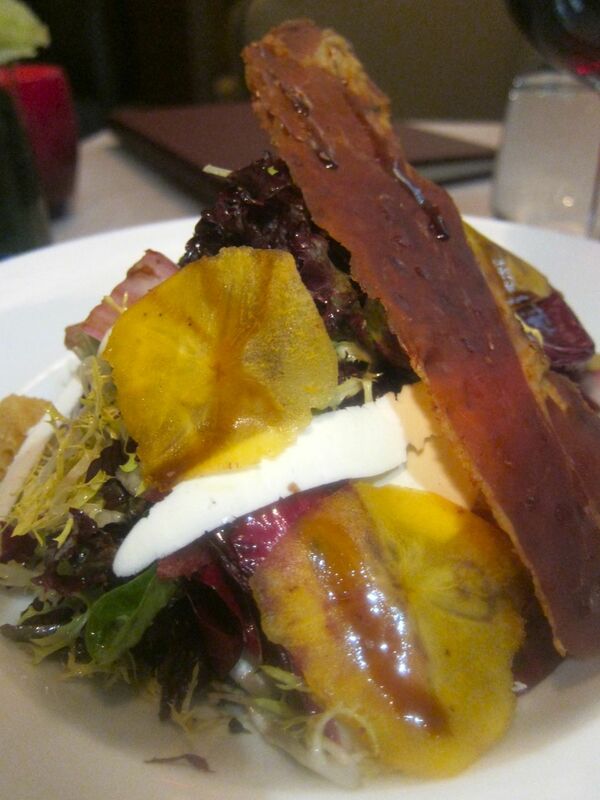 The winter salad is a lively toss with the exuberance I expect from Chef White. Back again late in January with friends who’ve not yet been, I agree to be seated in the bar. 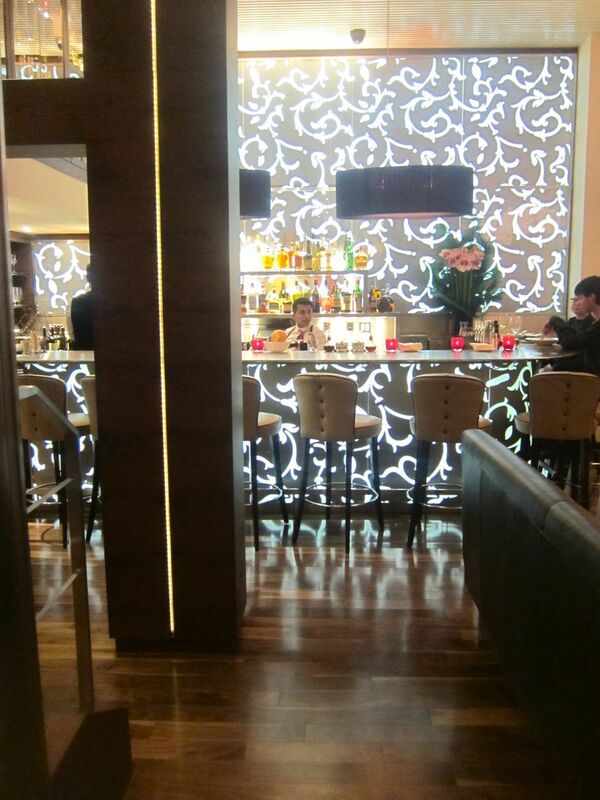 I hate the look of the bar itself with its wild paisley-like squiggles. But I want to try the bar menu. Forget it. There is no bar menu, says our waiter. Quiet is what there is. The ceiling is high. The window absorbs sound. I’ve stumbled on a sensory find. Here’s our view of the bar and the wine stash from our downstairs table. I am known here and the sommelier pours champagne. I prefer red wine. My friend’s guy has a $14 Manhattan. Bay scallops are lush and quivering, in a tangy blood orange and grapefruit emulsion with drops of puréed Sicilian pistachios. The winter insalata is an adventurous toss of Italian chicories, crisp prosciutto, persimmon thins, ricotta salata, croutons and black truffle vinaigrette, a diverting treasure hunt, as reported. Yes, it’s $19, but enough for two to divide – especially if you both need a crudo too and are sharing pasta. 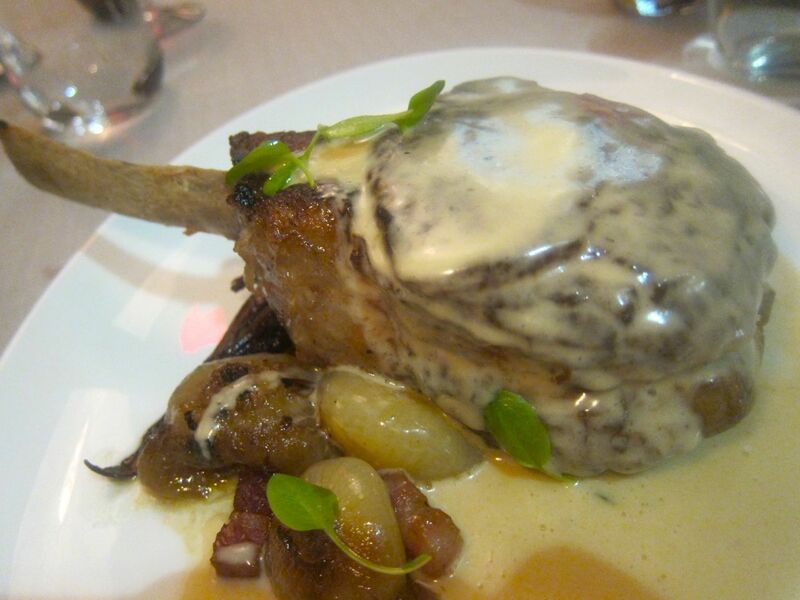 The pan-roasted veal chop is rich and rare and scarcely needs all that cream, but dive in. I like my veal chop rare, but not raw at the core. I send that message to the kitchen by our waiter. He is young and has yet to be fully broken in. He tends to wander. This $47 pan-roasted chop is huge, a real triumph of delicious excess -- fatty and very rare but not raw, Amish veal, I’m told. I suppose that means the animal grazed free and died not entirely unhappy. I might die too, given the blanket of pancetta cream poured on top, but sharing is a lifesaver. There are cipollini onions too, injected with fat and flavor, and a crispy aside, red endive wrapped in prosciutto and sautéed to a crunch. I eat more than my half, grudgingly, leaving the rest for my two friends to taste. 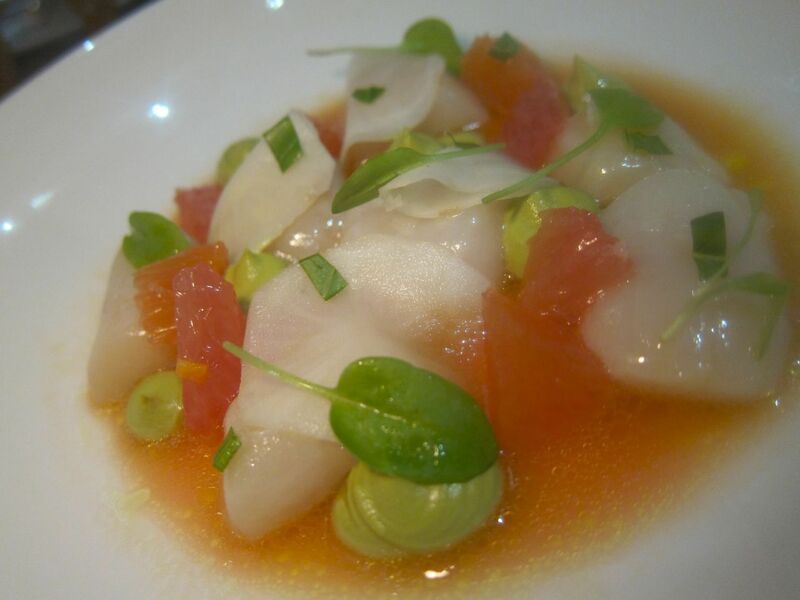 Voluptuous bay scallops sit in tangy winter citrus emulsion with dots of pistachio purée. I’m still not wild about the lobster and prawn risotto that totally thrills my companions. Clearly, I’m just being ornery. Heidi on my right has ordered a glass of red wine. It’s a $17 Pinot Noir. She’s unhappy with the pour. She’s right. It seems scanty in its big balloon goblet. “It looks like 5 ounces,” she complains to the waiter. “It’s a 5 ounce pour,” the waiter agrees. “But Ms. Greene’s pour was bigger,” Heidi protests. “We were told she should have a bigger pour,” the ingenuous chap confesses. It’s my birthday so I get to finish the luscious gnocchi with sliced wild mushrooms. What can I say? When you’re new to the neighborhood, selling dinner for $100 or more plus tip, it wouldn’t hurt to give 6 or 7 ounces of wine to customers who don’t happen to be restaurant critics. Still, our trio is mostly happy tonight. A runner pours crème anglaise on our warm, very sweet pear crostata and delivers almond gelato in a timbale on the side so it doesn’t melt. At $16, it’s the most expensive of the mostly $13 and $14 desserts. But as you may have guessed, prices are not an issue on Madison Avenue. 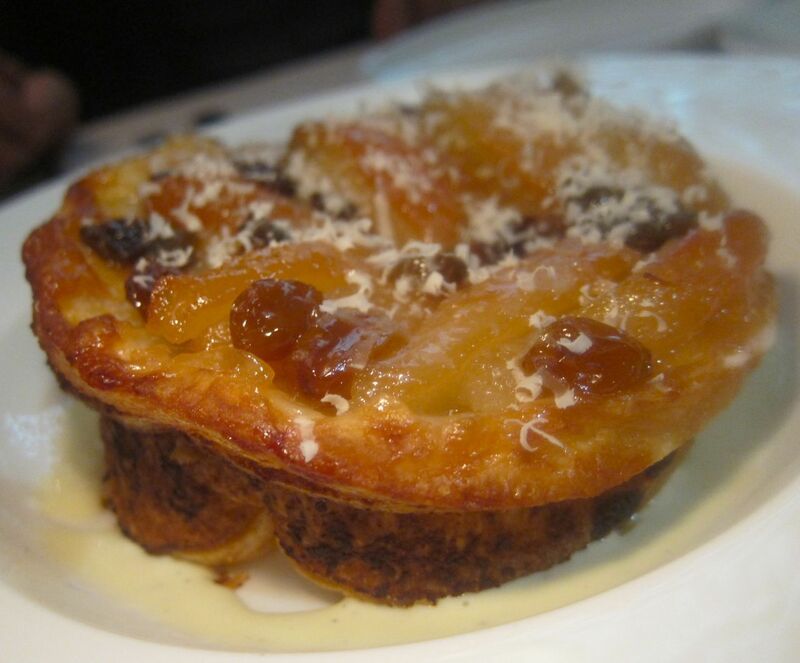 The vin santo pear crostata gets a pour of crème anglaise and almond gelato alongside. 1167 Madison Avenue between 85th and 86th Streets. 212 249 0444. Monday through Friday lunch noon to 2:30, Dinner Sunday through Thursday 5 to10 pm. Friday to 11 pm. Saturday and Sunday brunch 11:30am to 2:30 pm. Dinner Saturday 5 to 11pm. Photographs may not be used without permission from Gael Greene. Copyright 2014. All rights reserved.